When most people think of Ontario, the first city that tends to come to mind is Toronto—and with good reason. It’s a world city, Canada’s largest, it has everything from the CN Tower to the Toronto theatre and shopping districts. Even so, however, the bright lights of Canada’s biggest city can sometimes overshadow the other cities of in the metropolitan constellation which makes up urban Ontario, and perhaps no other city in the province shines so brightly as Hamilton. NHL fans will know the city for, among other things, its news-making attempt to attract an NHL team in past years. Still, many outside Canada are still unaware as to what Hamilton has to offer. Thankfully, with the recent wave of immigration which has brought people from around the world to Canadian shores, the city is getting more and more exposure. Here, then, are four immigrant groups in particular that have been making headway in Hamilton. Among Canadian cities, Hamilton is somewhat unique in that it is currently experiencing something of a mini immigration wave of fellow Anglophones—more than 15,000 British citizens have immigrated to the city in recent years, as well as more than 4,200 Yanks. While there are other interesting incidents of British-born Canadians migrating en masse to the Great White North—hello, London Ontario!—it’s the 4,200 American-Canadians that really stand out. As Canada and the United States have the longest non-militarized border in the world, it should come as no surprise that there’s a lot of cross-border exchange and tourism between the two countries. After all, the term “snowbirds” exists for a reason, referring to Canadians flying south for the winter and settling in the United States for a few months, or sometimes even deciding to make that move permanent. What’s more, Hamilton may be seen in one sense as a blend of Canadian, English, and American culture. With English roots that stretch back hundreds of years—Ontario arguably being the “most Anglicized” Canadian province in terms of overall historical and cultural influence—the tie to Great Britain is as obvious as it has been beneficial. 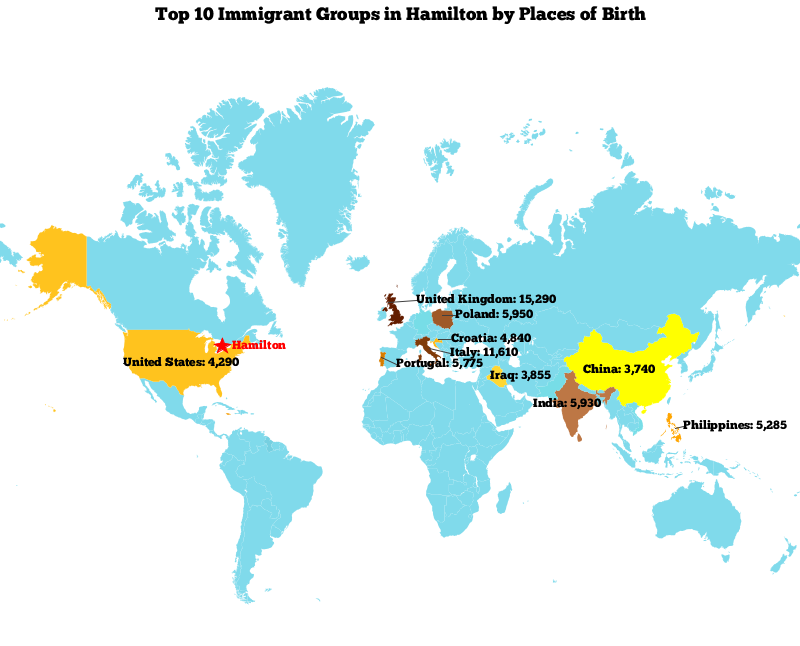 Almost a third of Hamilton natives can claim being, by way of ancestry, that they are an Englishman (and, yes, it’s been greatly to its credit). With regards to the American side of the equation, Hamilton has long been a bastion of culture and sports, and is home to the Canadian Football Hall of Fame—and really, what’s more “American” than American Football…even in its Canadian form? From there, you have examples of American shows such as The Big Bang Theory striking it big in Canada while Canadian-born stars have likewise made a huge impact on American pop culture, including William Shatner and the late, great Leonard Nimoy. Either way, if you’re an American or British citizen looking to settle down in the Great White North, Hamilton—and the greater Ontario area in general—affords you one of the best options for fellow Anglophones Canada has to offer. Who is Coming to Canada? Where Are They From? When most people think of Canadian Catholics, they think of Quebec—and with good reason. That being said, Hamilton is also something of a haven for Catholics of European descent. Whereas the vast majority of Quebec’s Catholic community is made up of Francophones, either native to Quebec or else made up of immigrants from French-speaking territories and nations, Hamilton is home to Catholics from a variety of different European nations, including Portugal, Italy, Portugal and Croatia, the latter two groups being especially notable. Quebec is home to some Portuguese and Italian-Canadians, but Hamilton is unique insofar as it hosts one of the largest and most prominent communities of Croatian expatriates in Canada. Nearly 5,000 Croats call Hamilton home, as do nearly 6,000 Poles. Anyone familiar with the crisis in the former Yugoslavia throughout the 1990s will be familiar with the plight of the Croat people, and thus have an idea as to why they might, even to this day, be interested in the religious tolerance and freedom which those precious few Croatian and Catholic communities abroad afford. Manitoba is home to a huge Ukrainian community, and of course Toronto is the ultimate Canadian melting pot, but if you hail from an at least Catholic region of Eastern Europe—Poland or Croatia in particular—you may want to consider giving Hamilton a try. To say Iraq has had a rough few decades or so would be an understatement of the most tragic kind. From the tyrannical reign of Saddam Hussein to the complications and insurgency which followed the Invasion of Iraq to the nightmare that is the Islamic State’s campaign of fascism and fanaticism which has already caused such horrific suffering and destruction, it should come as no surprise that many Iraqis have decided to flee their home country before things get even more violent. The Iraqi, Kurdish, and Yazidi Diasporas are all ongoing and will certainly be the subject of study and debate for decades to come, but for right now, at least one bright spot may be found in the manner in which close to 4,000 Iraqis have come to call Hamilton home. That may not seem like a lot, but put into perspective, it’s a sizeable portion of the Iraqi expatriates, and make for a small but pertinent community in Hamilton. One of the immigrant groups which has seen the biggest boom over the course of the last 15 years or so, Indian-Canadians have been making their presence known from Vancouver to Montreal. Even so, perhaps their largest concentration is in Ontario, in places like Toronto, Mississauga, Brampton and, yes, Hamilton. According to the 2006 Canadian census, about half of the immigrants who immigrated to Canada in the first few years of the 21st century were of Asian or Middle Eastern descent. We’ve already touched on one such case with the Iraqi-Canadian community mentioned above. While that community is—while growing—still small, the Indian-Canadian community is positively booming from coast to coast. From British Columbia to Alberta to Ontario and beyond, this trend has continued across the Canadian landscape, and Hamilton is no exception. Toronto offers a larger cityscape, and Brampton has a higher concentration of Indian-Canadians, but if you’re looking for the best of both worlds, or else just looking to branch out a little while still immigrating somewhere that’s amenable and welcoming to immigrants from the Indian subcontinent, Hamilton may be well worth a look. What are the best locations for Indian nationals looking to immigrate to Canada? Let’s take a look.